Everyone knows you can use saw horses to make a table from an old batten door. But I want THESE saw horses and the links don't even mention them. Boo Hoo. Let me know if you know where to find them. Thanks. Never mind, I found them myself at Ikeahttp://www.ikea.com/us/en/catalog/products/80130776/ for a super reasonable price of $15.00 each. Available in white and gray. Hooray. The handle left on the door is such a clever touch. Thanks for your research on this one! I love the idea and the worn door looks so cool. Wouldln't we all be lost without Ikea? I love the marriage of the old worn door with the new saw horses. Something tells me Ikea should be preparing for a run on this item. Not only is the idea of using the old door brilliant, painting the floor green is too! Gorgeous! 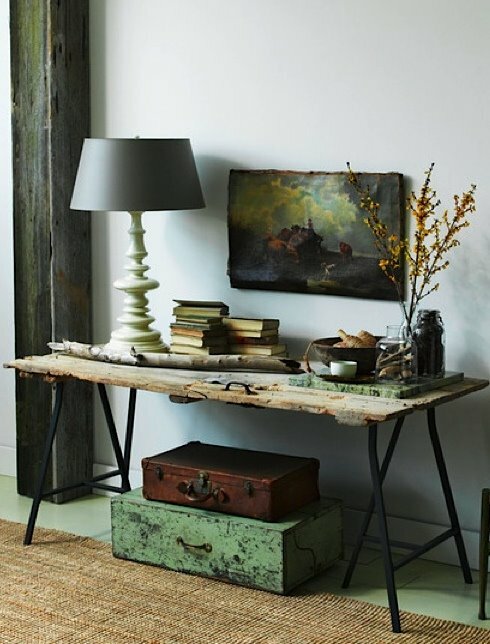 What a beautifully styled door/table/desk and room. I love everything about this space and wouldn't change a thing. I'm not usually drawn towards green but this space is so well done and appealing. IKEA...rocks! We've had an ongoing affair for 31 years and it's still going strong. The saw horse is from Ikea! They are super cheap and take very little time to assemble. The door is just resting on the stands. Not attached. The weight of the door holds it in place. Easy to move around from place to place or dismantle and put away. Does anyone know if Ikea still has these. I can't find them on their website! This is exactly what I am looking for. I found it! Ikea still has it and it is 15.00 now. I can't wait to get started on this project!